August 20 was the Full Barley Moon . . . or Sturgeon Moon . . . or Fruit Moon . . . depending on whether you’re English or a farmer or a Cherokee. 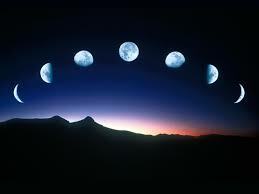 I have been propelling myself forward through time by means of a lunar calendar for the past fifteen years. The calendar I deploy for this is a datebook entitled, We’Moon: Gaia Rhythms for Womyn. It is one of those intensely earnest feminist publications, bristling with women’s art and poetry and packed with astrological information, which I ignore. It is my resource for moon phases, solar events and pagan festivals – all vital, need-to-know information, if you’re me. Every day I wake up, weigh (naked, by which I mean not so much as a hair pin or an earring to tip the scale), mark down that day’s weight, and whether I attended a yoga class the previous day or took the dog for a long walk or both. I also document the degree to which my attempts to not drink myself to death were successful the previous evening. Sometimes I’ll scribble something of a more diaristic nature, like “Bartlett Lodge for 20th anniversary!” or “Off to Montreal for Brina’s wedding!” but more often I do not allude to events taking place in the real world. I do, however, allude to events taking place in my head. I am addicted to New Leaves. Well, not so much New Leaves per se as to turning them over. That’s where moons come in. Most months have two moons – a new one and a full one. Every once in a while you get a blue moon – a second full moon in one month. Bonus! Yes, there are waxing half-moons and waning half-moons … but they don’t count. Why? Because I decided so and, since this is all in my head, that’s my prerogative. Moons provide an excellent opportunity to turn over a New Leaf, something I, as a bad person, quite regularly need to do. What do I mean by bad? Well, not Hitler bad. Definitely not Ann Coulter Bad. More . . . Bad Rabbit. My personal motto is, “love that full well that you will lose ‘ere long.” Do I live by it? I do not. Therefore I am bad. Therefore I need to turn over a New Leaf. Therefore I need a moon. Or a solstice or an equinox. Or a good old rousing pagan festival – an Imbloq or a Beltane or a Lammas or a Samhain. Any one of these will do. Just not half-moons. That would be too easy. If one of those three intervals is not available, then I must just stew in my slough until enough time passes that I can at last go into Turning New Leaf mode: wash my car, take a ritual bath, buy myself something new that will serve to remind me of my new intention (Yay! ), then . . . Turn the New Leaf. Tah dah! I am transformed! The New Leaf, once turned, is bright and pliant for a few days. Then it begins to dry out. Then it crumbles to dust and, once again, I find myself leafing through my We’Moon to determine just when next I can legitimately turn over a New Leaf. Because I really need to. Because I really want to change. I can’t go on like this. I can’t. Once a woman behind the counter in an ice cream parlour offered me a sample. “Oh, I’m not allowed to eat ice cream,” I told her, then thought, Did I say that out loud? Because, of course, the person who does not allow me to eat ice cream … is me. Once, years ago, I decided that I should put an end to New Leaves, that the next New Leaf I would turn would be that I would turn no more New Leafs. In other words, this was my last New Leaf. Ever. So I wrote down my intention on a piece of paper and burnt it in a small cauldron I retain for such purposes.